Did you know that indoor air pollution has been described by the EPA and Congress as America’s #1 environmental health problem? The EPA also reports that indoor air can be up to one hundred times more polluted than the air outside. One hundred times! Air pollutants and poor indoor air quality can cause allergies, sick building syndrome, bacteria infections, and spread viruses, to name just a few. JW East Mechanical has the experience to significantly reduce indoor air pollutants in order to improve the quality of the air that you breathe. This is especially important to those with allergies and asthma as well as those who simply want the cleanest air possible in their home or workspace. It is important to understand the different sources of indoor air pollution, in order to understand the air purification strategies that we recommend. 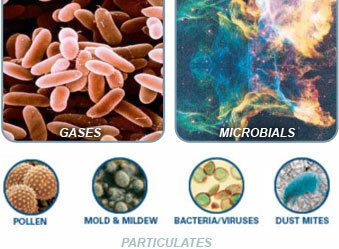 When it comes to indoor air pollutants there are 3 sources – particulates, gases and microbials. Particulates are tiny particles suspended in the air. Common particulates include residential pollen, dust mites, dust, smoke, and dander (skin flakes). Particulate diameters are measured in microns and range from .001 to 1,000 microns. These dimensions represent the continuum from a few molecules up to the size where particles can no longer be airborne. Particulates are removed from the air by filtration. 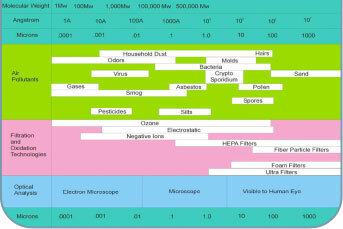 As you can see from the chart below, air filters differ in effectiveness as they can trap different size particulates. JW East Mechanical recommends April Aire air purification technologies. These are bacteria, germs, viruses, fungi, spores, and mold. Although bacteria are small in size and usually microscopic, they have an amazing ability to do horrible damage to all living organisms, including humans. Many everyday illnesses are also caused by viruses, like the common cold or the flu. Microbials are living organisms that must be killed. 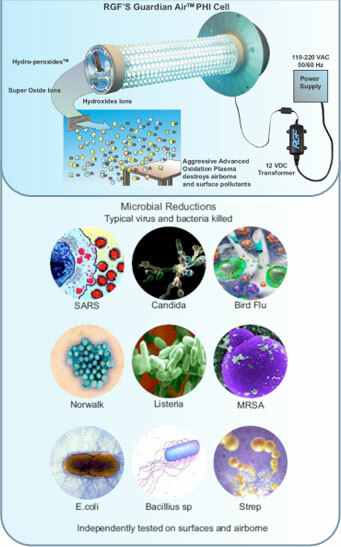 JW East Mechanical recommends RGF’s Guardian Air, as it is the only proactive system that aggressively kills microbials throughout the entire home or building. There is more information below. Again, JW East Mechanical recommends RGF’s Guardian Air, as it is the only proactive system that aggressively kills odors and gases. We have numerous testimonials regarding the removal of pet odors, paint odors, musty smells, and general odors in homes and businesses. JW East Mechnical recommends RGF’s Guardian Air because it does not need the pollutants to travel to the air handler for UV treatment or filtration. Guardian Air is proactive and sends ionized aggressive advanced oxidizers into the room to destroy the pollutants at the source, in the air and on surfaces, before they can reach your family, clients or employees. RGF first developed its Advanced Oxidation Technology over 20 years ago. Over 1 million RGF Cells are in use around the world. The Guardian Air is used by many Fortune 500 companies, the US Government, cruise ships, hospitals, nursing homes, schools, commercial buildings, and homes across the world. The Guardian Air has been approved by the EPA, USDA, FDA and US Government. The Guardian Air is installed as part of your home’s central heating and cooling system, completely out of your way and out of sight. That means each and every time your system runs, the Guardian Air produces naturally-occurring oxidizers that travel through the conditioned air space in your home or office and kills bacteria, viruses, mold, gases, and odors. The main difference with UV light systems and whole-home air cleaners is that they are passive systems. The germs and particulates have to make it to those systems in order for them to work. How does that protect you from somebody coughing or sneezing in a room? How does that protect you if the germs attach themselves to an object – like a cup or another person? The Guardian Air is an active system. It generates oxidizers that travel through the conditioned building space and proactively kill germs before they have a chance to spread. For example, in an independent sneeze test, the Guardian Air was proven to kill 78% of bacteria within three feet of the sneeze. The bacteria were killed before they had a chance to infect somebody else. We are a family owned and operated business serving Southeast Texas for over 25 years. The success of JW East Mechanical is largely attributed to the fact that we treat each home and business like our own. Copyright © 2016 J.W. East Mechnical. All Rights Reserved.